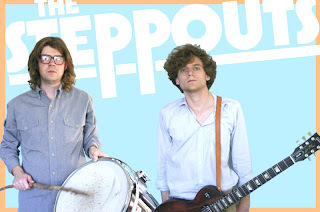 The Steppouts is the studio project of guitarist Barrett Alley and John Winter. Thanks to some lo-fi fuzz from engineer Stuart Sikes, who has worked with groups like The White Stripes and Modest Mouse, the duo sounds as if they could have recorded from a garage. 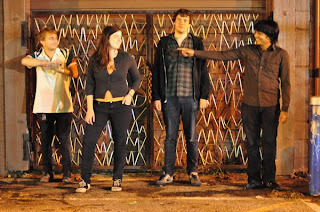 Their blues infused rock follows a little too consciously in the footsteps of the White Stripes at times, but Alley’s reserved Texas drawl keeps things a little below the boiling point of the all out rock abandon White sometimes flails into. Instead, the two hearken back to garage rock’s early days. Loud, gritty and full of nonsensical, vaguely rebellious lyrics, “Venison Stew” sounds like a stomping reply to “Subterranean Homesick Blues.” There is a slight snarl to Alley’s vocals, but they’re channeling an attitude that predates punk rock. Their new album, Demons and Devotees is straight rock and roll. We’re going back to the garage again for our second submission pick this week: this time from Atlanta Georgia’s Carnivores. On their Myspace, the band says that in order to get a handle on their roots, take a “psychedelic trek into lo-fi tropicalia, lounge and death-afflicted sound collages that defy easy categorization.” That’s a good place to start to describe their new album, All Night Dead USA. Much more on the psychedelic side than our other pick, The Steppouts, Carnivores sound almost like a lo-fi Animal Collective at times. Other times, they’re just creating washed out, grimy yet melodic soundscapes that utilize the whole band. There’s also a strangely tropical vibe to songs like “Heart of Copper” with overly distorted beach chords that feel like the band taped up some palm tree cutouts on their garage door. It’s nice to see someone do a little bit of decorating to change up the scenery.